Build student confidence in Mathematics in preparation for the new 9-1 exams with these unique sets of practice exam papers. 10 sets; 30 papers per board per tier. Well-designed papers with clearly worded questions – methodically written and checked by mathematicians and teachers! 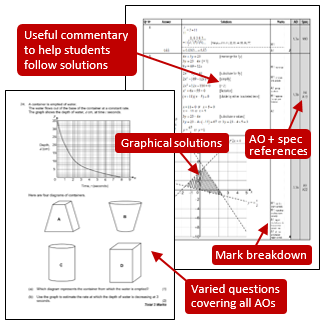 Write-on version – mimics exam layout, perfect preparation for the real thing! Non-write-on versions include optional short work booklets for the occasional questions where writing directly onto the question is useful. Designed for students and teachers! Separate answer column for faster marking!